​Sorry, Video Catnip has gone on a little Cat Nap...we will return soon. "TV Fun Time for My Kitty"
or 2 DVDs for just $34.90! Is your cat bored? Need to leave him home alone at times? Is she getting into too much mischief? Looking for more fun than the usual kitty toys? Looking to give your cat years of fun? 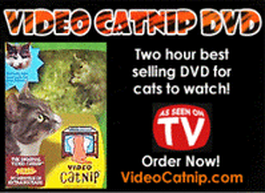 VIDEO CATNIP on DVD is for your kitty! have been entertained by Video Catnip on DVD! It started the video for cats craze and has been the best selling video on DVD for cats to watch for over 20 years! Video Catnip has been featured on TV and radio and in newspapers and magazines across the country since 1989! 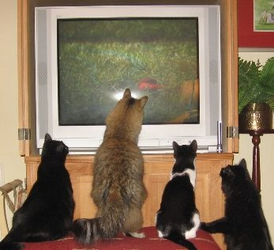 Here are some of our ONE MILLION happy customers having fun watching Video Catnip on DVD. Think of the joy you'll have watching your kitty having so much fun, again and again! ever made for feline entertainment! VIDEO CATNIP on DVD is full of two hours of bird, squirrel, and chipmunk outdoor action that your indoor kitty will love watching over and over, year after year! Guaranteed! Your kitty's DVD starts with a short musical introduction followed by the crazy and zany antics of our animal cast of birds, squirrels and chipmunks (all naked by the way:), accompanied by an all natural soundtrack in Dolby stereo. Video Catnip on DVD auto-repeats for continuous play. Cats have been mesmerized and excited for years by the crisp images and quick movements of the best selling DVD for cats ever made. Indoor kitties will watch Video Catnip over and over and over....year after year after year! This is the one that started it all, with over 400,000 sold! CAT-TV II on DVD is our 2nd biggest selling DVD. It's 90 minutes full of a VARIETY of animal action. Indoor birds, outdoor birds, fish, chipmunks, mice, rats, and a couple of very active squirrels. A natural soundtrack makes it easy on kitty's ears. The DVD does not automatically repeat by itself, (like the Video Catnip DVD), but you can program your DVD player for continuous play. This is a terrific companion DVD to go with our VIDEO CATNIP dvd, giving your kitty a lot of variety of different animal action. 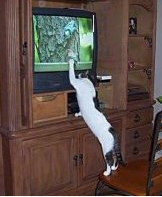 Click here for our "TV Fun Time For My Kitty" SALE!! Your Kitty's Viewing Satisfaction Guaranteed! click here to find out about our 100% money back open and try it guarantee. best selling video for pets to watch, Video Catnip, was created.